You can tell it's the night before the recycling is picked up in my neighborhood not by the number of blue recycling bins on the curb (many of which are placed on the curb in the morning before the homeowner leaves for work), but by the rattle of pushcarts that punctuate the stillness. 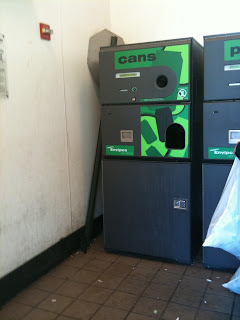 The number of people seeking recyclable cans and bottles to return for a profit seems to have increased, including a range from dedicated collectors to those whose "amateur" efforts involve allowing their own cans and bottles to accumulate for several weeks before bringing them in to the bottle depository or working with neighbors to generate a large enough supply for a sizable return. Who are these people, and why do they persist with this dirty, smelly endeavor? At least once a month on a Monday night a platoon of can collectors prowl the neighborhood in search of cans and bottles they can return for the nickel deposit. I call them the pushcart prowlers. These seekers are mostly older Asian women. They're busiest during the summer and the holiday season, and they're quite bold—if your bin isn't on the curb, they'll venture up the driveway in search of potential loot. If you have a party, they're often there the very next night in search of soda and beer cans and bottles. It's hard to determine if they're a team or if they're independent operators, or if they're simply united in camaraderie. On some nights, they seem to operate as a single unit, calling to each other and dividing the streets and houses into sections. On other nights, there may just be one or two pushcart prowlers moving quickly as if trying to out-compete each other—with some houses getting two visits from these searchers in one night. It's likely they are some combination of team and independent enterprise, but they aren't very talkative so I haven't been able to learn much about them. This group is different from the regulars I see on mornings lined up at the bottle deposit at my supermarket. These folks are definitely independent collectors. Some have garbage bags filled with recyclable cans and bottles. They have routes, but more often, they have arrangements. This group works with neighbors and local businesses to arrange a pick-up of presorted recyclables, which they then return for a profit. They operate like entrepreneurs, taking orders for their "services" which they perform for free in exchange for the recyclable materials. They have long been a part of the recycling for profit landscape—as a child, I can remember that using the bottle deposit was popular among the Trinidadian immigrant community as a means of making extra money. There are also folks with small plastic shopping bags. They collect far less, but they are there anyway. Earl, whom I see on many mornings, is a member of this group. He's there at the bottle deposit every morning at 6:45 waiting for it to open so he can redeem his collection for change. On mornings when I walk to the LIRR station, he's also a beacon during those predawn hours when the neighborhood is still sleepily stirring and few people are out and about. One of my walking routes to the LIRR takes me through the supermarket parking lot and he and his fellow collectors represent a safety zone of sorts. He can be counted on to be there, getting his bags out of his trunk or walking the parking lot with his hands in his pockets. And on the single occasion I had reason to be concerned by some unwanted early morning attention, he and his buddies were a welcome sight. Their presence was enough to assure my safety—though it didn't stop my from changing my route for a few days. And then there are the folks looking to pick up some extra change. They don't go out of their way to gather recyclable materials, but will allow items to accumulate at home for a few weeks, and then make a trip to the bottle depository. While the more entrepreneurial of these folks have "contracts" with local businesses and homes to pick up presorted cans and bottles, others have routes that they patrol on a nightly basis following the neighborhood recycling schedules. They often have go through the recycling bins and it's dirty and sticky work. Many wear gloves and carrying hand sanitizer is a must. They smell like soda and beer—which is also the way the depository smells. And often, they have a a "uniform"—a set of clothes they wear specifically for collecting purposes which has often been stained by the residue from dirty bottles and cans. They must work quickly and cautiously and there is always a concern that they may be cut from a can or broken shard of glass. While many view their endeavors as a business enterprise, some feel there is some stigma associated with their work. They admit to hiding their actions from friends and family feeling that it makes them "look poor." Others don't want anyone to know that they involved in "dirty" work. It's easier to hide these sorts of activities when you're a single individual or if you're a shift worker. It gets harder when the bottle deposit is a secondary income because it requires coordination, and late nights out need to be explained to spouses and significant others. But the bottle depository also seems to offer independence and a sense of control for some: Earl started collecting cans after his wife passed away. It gave him a means of passing the sleepless nights that ensued. And it also gave him some pocket change. He isn't as methodical as the collectors who gather garbage bags full of recyclable materials, but he doesn't try to be. He's not "in the business," as he says. He doesn't prowl the streets visiting residential neighborhoods nor does he have a regular route, rather he collects what he finds where his nightly wandering takes him. So if he's at the park one night, he collects what he can there. If he visits Dunkin Donuts, which he often does throughout the night, then he picks up what he can find along the way. His return for his efforts is small—a few dollars at most—but for him, collecting seems to be a way to hold loneliness at bay. His "earnings" are enough to pay for a cup of coffee once or twice a week. Trends Near You—Tell Me About Them! 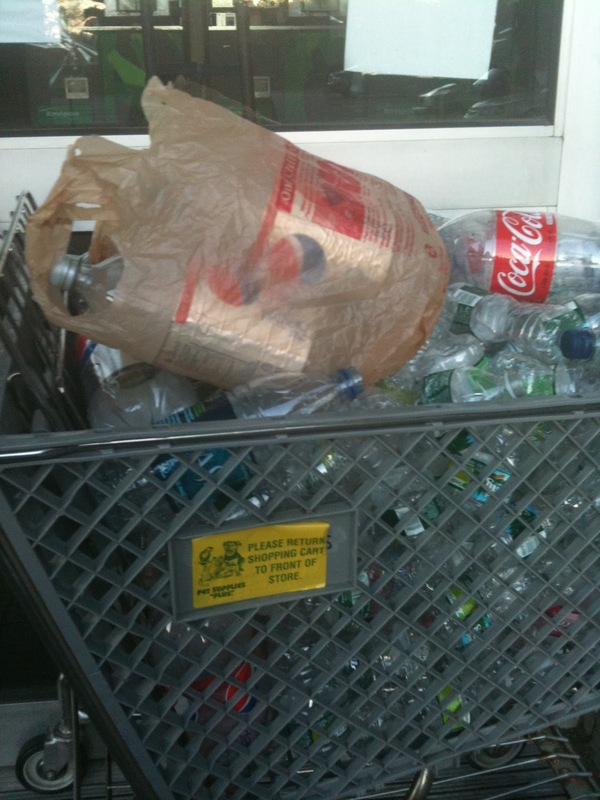 A shopping cart with recyclables. While there has long been a "business" associated with collecting and returning bottles and cans for a refund, the bottle depository seems to have taken on greater significance as more people feel pressure from mounting economic woes. 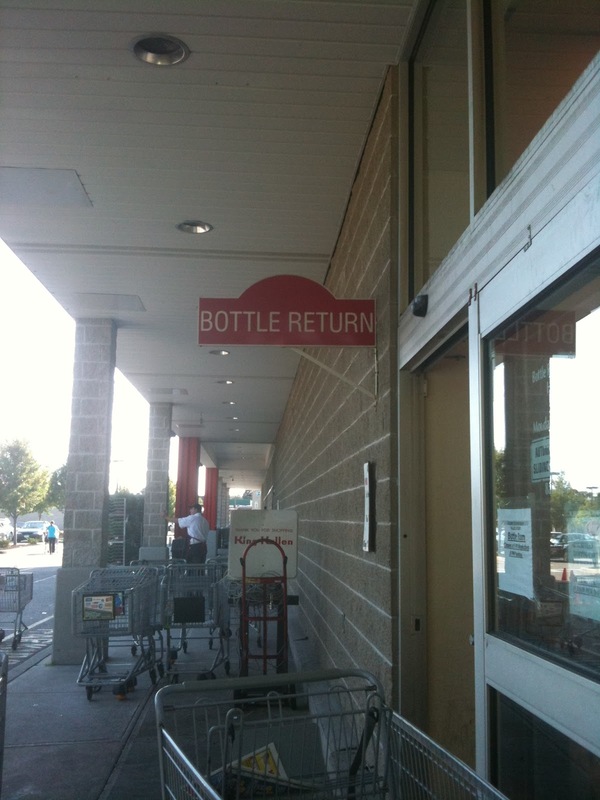 There definitely is a steady stream of traffic there on the weekend, something that the supermarket manager has noticed because he has to schedule more cleanups for the bottle depository. It's a job that few of his employees enjoy. But they make the most of it—it gives them a chance for an impromptu cigarette break. The depository has also created some tensions with customers. While organized collectors keep their findings in garbage bags, some have taken to putting their finds directly into the shopping carts, which leaves a dirty, sticky mess for supermarket patrons. And the manager does not have a plan in place for cleaning the carts. 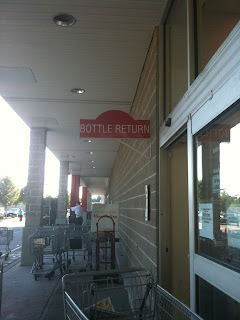 They aren't supposed to be used by the bottle deposit patrons and he isn't clear on the best way to enforce this rule. The carts stored near the bottle deposit are often untouched by supermarket shoppers—and you can't really blame them. More and more, we are hearing about the "new normal" where saving and cost cutting measures are on the rise. For example, people are looking for sales more frequently, buying generic brands, and using coupons with greater frequency. Is this another example of the "new normal"? This couple paid for their wedding by recycling cans! I can't say I've particularly observed a change with recent economic times, but that is I suspect mostly an artifact of habits and locations. However,t his post reminded me of the first Chapter in the book _The Ghost Map_, entitled "The Night-Soil Men" which described in detail the people who toiled at night to gather the refuse of 19th-century London, which they used to make a living. I also noticed similar activities while watching a documentary which followed a man living in Beirut; as he drove around largely picking up cardboard boxes. Clearly he was making enough money to pay for gas! @Alyssa - What a wonderfully weird story! @Hasufin - I admit when I was working on this post, the image that kept coming to mind was the coal pickers of the Great Depression. I encountered a lot of the same issues that I read about in connection that group—notably feelings of shame associated with their activities even though it is "honest" money. I'm also not sure it is directly associated with economic times, but wanted to float the idea and see what others thought/were seeing in their own neighborhoods. As a kid, I knew of several folks who supplemented their income (rather nicely, too) by collecting cans. I'm just surprised that so many "regular" folks seem to be participating in recycling for profit as well. After all, it requires more effort than just putting the materials out for collection. So in general, I'd expect to see more scavenging in area with less public services and obviously in areas with higher population density. Scavenging likely can make good money even in a good economy (as was the case in 1850s London). It seems likely the social stigma is increased in a good economy, but that would reduce the number of people scavenging, meaning the fewer scavengers would make more money (and possibly reduce the social stigma?). Poor economy tends to result in a reduction of public services though, as is happening in some US towns, plus of course a reduced social stigma on scavenging - so a poor economy indirectly increases scavenging in at least two ways, possibly three since unemployed people would be more willing to scavenge for money. The thing is that my neighborhood has a curbside pickup for recyclables, so the services are there. The organized collectors (including the pushcart prowlers) strategize to get the bottles and cans before the town can pick them up. Now granted, there are plenty of things you can't redeem for change—aluminum cans, for example—so the town services are definitely still needed if the community is going to recycle. The lack of recycling services may definitely encourage can and bottle collecting but I'm not sure that's a factor here. Services haven't been cut—yet. If services are cut, it may go a long way toward legitimizing these actions in terms of reduced social stigma. I'll see what else I can find out about this. My interest in piqued. How do you think the scavengers in your area are perceived? 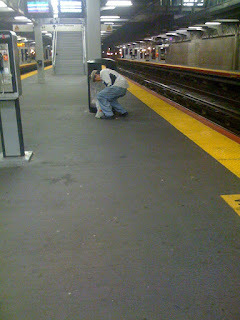 I would hypothesize that in places with poor public service, scavengers would be considered as basically honest people who serve a role in society, even if a distasteful one which is low on the social ladder - whereas I suspect that scavengers in areas with better public service might be perceived as being borderline criminal. Does that match your observation? "How do you think the scavengers in your area are perceived?" I think you're pretty close with your hypothesis. There is *something* "suspicious" about the pushcart prowlers, but that perception may in part be due to them not really socializing with the neighborhood residents. "If you're going to come up my driveway in the middle of the night, you could have the decency to say hello if you see me, or just ask for the cans" kind of thinking. In Corona, where S took the picture of the mom and kids, though there are public recycling services, but the neighborhood has many low income families, so I think these sorts of activities are the norm. I wonder if the rise in regular folks using the bottle depository in my neighborhood might shift the perception of the pushcart prowlers. I wonder how much the lack of socializing is an issue. There are plenty of people, especially service people, with whom we don't socialize. Odds are, you've never spoken with the people who haul your garbage. Heck, when I was paying to have my lawn mowed, I had three guys with whom I didn't share a language come onto my property. I suspect the distrust is largely influenced by a certain suspicion that scavenging is illegal. It's not (although trespassing is!) but when we see people doing something which we're not sure to be legal, we tend to assume they're up to no good. Socializing with scavengers might alleviate that, but I wonder if the original judgment is caused by beliefs about the activity.